INDIANAPOLIS, IN - To celebrate the joys and benefits of playing music, NAMMthe not-for-profit association of the music products industryhas teamed with Sesame Workshop and Music for All to create a "musical extravaganza" float for the 2009 Tournament of Roses Parade. The parade will take place in Pasadena, California on January 1, 2009, with a theme titled "Hats Off to Entertainment." Sesame Workshop, the producer of "Sesame Street," is a nonprofit educational organization and a well-known advocate for integrating music into its television program to help children learn and grow. This is the fourth year that Sesame Workshop has collaborated with NAMM on a float for the Tournament of Roses Parade. Music for All's mission is to create positive life-changing experiences through music. This is the second time Music for All has formed the Bands of America Honor Band, an ensemble representing high schools nationwide. 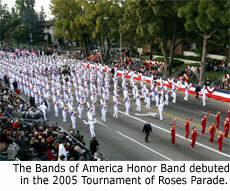 The band first appeared in the 2005 Tournament of Roses Parade. This year's band comprises more than 300 musical performers, a 22-member dance team and a 32-member flag team. The performers will meet for the first time in Southern California on December 27, 2008, to prepare for performances in the Tournament of Roses Bandfest and the Rose Parade. George N. Parks, a prominent trainer of drum majors in the country and director of the University of Massachusetts Minuteman Marching Band, will lead the Honor Band, assisted by an all-star staff comprising directors of some of the nation's top high school music programs. Selected band members auditioned and have rehearsed the music using the latest music teaching technology, MakeMusic's SmartMusic®, which has allowed the teaching staff to help prepare the musicians despite the geographic distances between them. The Honor Band will play a live original medley of "Sesame Street" hit tunes, compiled by award-winning arrangers Michael Klesch and Thom Hannum, and a variety of other musical pieces celebrating the joys of making music. The musical compilation will feature six different solo breaks to highlight each of the individual segments of the marching band ensemble. NAMM is returning to the parade for the sixth consecutive year and is once again showcasing its message that playing music brings powerful benefits for people of all ages. Overflowing with live music and depictions of how much fun playing music can be for everyone, the NAMM float and Music For All's Honor Band have joined to form a featured "mega" unit. The flower-covered creation will comprise a larger float with three smaller satellite "pods" riding alongside it, and will feature a variety of musical talent. 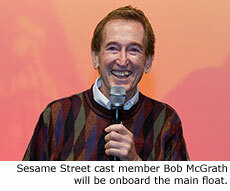 Onboard the main float will be an animated Big Bird shown playing a horn, and celebrity Bob McGrath, original cast member of "Sesame Street" who plays the music teacher on the show. Performing on the main float will be a string quartet, a jazz combo, and two backup vocalistsall against the backdrop of the traditional "Sesame Street" lamppost. The three pods will feature a sculpted Elmo character along with a saxophone soloist; a crafted Abby Cadabby and a Latin guitarist; and a large sculpture of Oscar the Grouch and two garbage can percussionists. A 24-person World Drumming unit will perform alongside the float with the marching band ensemble. 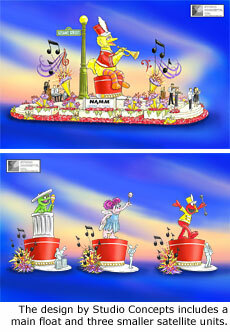 The 2009 entry will be NAMM's sixth as a float sponsor in the Tournament of Roses Parade. In 2007, NAMM's "Natural Harmonies: Oh Say Can You Sing," won the Craftsman trophy for Exceptional Showmanship and Dramatic Impact for a float more than 55 feet long. In addition, NAMM's 2006 float "Making Music is Magical," designed with Disney's Little Einstein characters, won the prestigious Grand Marshal's trophy for excellence in creative concept and design; NAMM's 2005 float with Sesame Workshop, "Music Makes Us a Family," won the Bob Hope Humor trophy as the most comical and amusing float in the parade; and NAMM's first-time entry in 2004 in partnership with Sesame Workshop won the Isabella Coleman Award for Color and Color Harmony through Floral Use. Music for All combines regional and national music-event programming with awareness campaigns, research and advocacy aimed at expanding access to music in schools and communities. A 501(c)(3) not-for-profit educational organization, Music for All promotes the widely documented lifetime benefits of music education and addresses the growing concern that public policies have created barriers to providing music and arts programs as part of a basic education for all children. The organization is the product of the 2006 merger between the Music for All Foundation and Bands of America. Music for All's 25-plus annual events include the Grand National marching band championships, to be held this November in Indianapolis' new Lucas Oil Stadium, the Music for All National Festival for concert bands, orchestras and percussion ensembles, the Summer Symposium international music camp and a series of regional marching band championships held across the country each fall. Sesame Workshop is the nonprofit educational organization that changed television forever with the legendary Sesame Street. As the single largest informal educator of young children, local Sesame Street programs produced in countries as diverse as South Africa, Bangladesh and India are making a difference in over 140 nations. Using proprietary research to create engaging and enriching content, Sesame Workshop produces programs such as Dragon Tales and Pinky Dinky Doo. In addition, multimedia needs-driven initiatives provide families tools for addressing such issues as children's health, military deployment and emergency preparedness. As a nonprofit, product proceeds and philanthropic donations support Sesame Workshop's educational research and creative content for children around the world. Theme logo courtesy of Pasadena Tournament of Roses. Bob McGrath photo courtesy of NAMM. Band photo courtesy of Music For All/Jolesch Photography.